This delicious two tier Funky Spotty cake has both levels of cake dipped in chocolate and is decorated with bright and colourful iced dots and a spray of multi-coloured sugar hearts. This delicious cake is chocolate dipped to both tiers. The top round tier is surrounded with a bright yellow satin ribbon and a bright orange satin ribbon surrounds the bottom square tier. 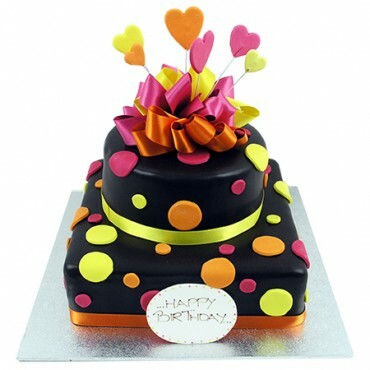 The cake is complimented with bright orange, yellow and pink iced dots throughout the whole cake and topped with a colourful parcel bow amongst a spray of brightly coloured sugar hearts. This design includes an inscription sugar plaque on the bottom tier.